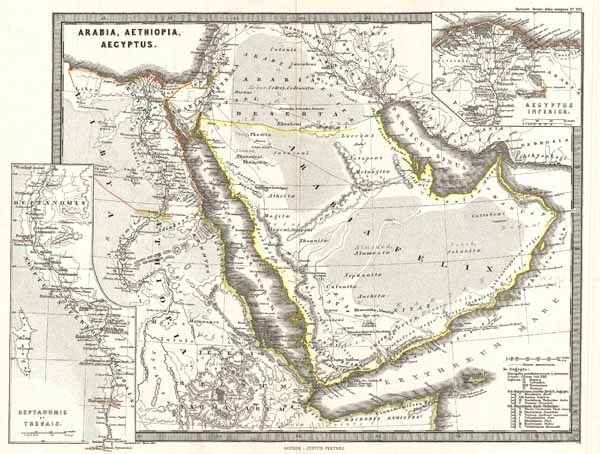 A particularly interesting historic map, this is Karl von Spruner's 1865 rendering of Arabia, Aethiopia (Ethiopia) and Egypt (Aegyptus) in antiquity. Centered on the Red Sea or Mare Rubrum, this map covers the entirety of the Arabian Peninsula, the Persian Gulf, and the Nile Valley as far south as Lake Tana (Pseuba), the source of the Blue Nile. Like most of Spruner's work this map overlays ancient political geographies on relatively contemporary physical geographies, thus identifying the sites of forgotten towns and villages, the movements of armies, and the disposition of lands in the region. This particular example includes both ancient Latin and more contemporary Arabic names (transliterated of course) for many important regions and sites. Additionally, two inset maps are offered. In the lower left hand quadrant a map labeled 'Heptanomis et Thebais' focuses on the course of the Nile from Heptatnomis (near Fayum) south to just past modern day Aswan, covering in the process many of the ancient Egyptian cities now submerged under the waters of Lake Nasser. Another inset, in the upper right quadrant, focuses on the fertile Nile Delta, forming an inverted triangle between Alexandria, Memphis, and Casluch. As a whole the map labels important cities, rivers, mountain ranges and other minor topographical detail. Territories and countries outlined in color. The whole is rendered in finely engraved detail exhibiting the fine craftsmanship for which the Perthes firm is known. Rumsey 1626.030. Phillips (atlases) 3288. Espenhorst, J., Petermann's Planet, p. 397-404. Espenhorst, J., Andree, Stieler, Meyer & Co., p. 148.